I’ve had a run of pretty awful books lately, so I figured it was about time that I picked something with a chance of being at least pretty good. Call it a weakness, but long chains of regrettable reads do in fact begin to wear on me. Sometimes I wish I were made of sterner stuff, but there you have it. I’m mortal. So it was with the knowledge that Leigh Brackett was a genius that I picked a book that itself is lauded as one of her better works. Full disclosure: I say I picked this book but it was actually my roommate who found it at the used-book store and brought it home. I was pretty thrilled by it and I also admit that the entire first paragraph of this essay is just justifying the fact that I really, really wanted to read another Leigh Brackett novel. It also helps that this one was very short. The book starts on Mars. It also middles and ends on Mars, which is convenient. Our hero is an explorer/archaeologist guy named Matthew Carse. It is probably a coincidence that this book, often compared favorably to the works of Edgar Rice Burroughs, has a protagonist whose surname is just a few letters away from Carter. Unlike John Carter, Matthew Carse isn’t a fightin’ man from Virginia. He’s only barely from Earth. I think he moved to Mars when he was five. He definitely grew up there, which is unusual for this world, although we don’t get any information on family or childhood. There are several other races on Mars, all native, and Carse isn’t much accepted by any of them. Things get rolling when this Martian shows up and shows Carse a sword. It’s a pretty old sword. 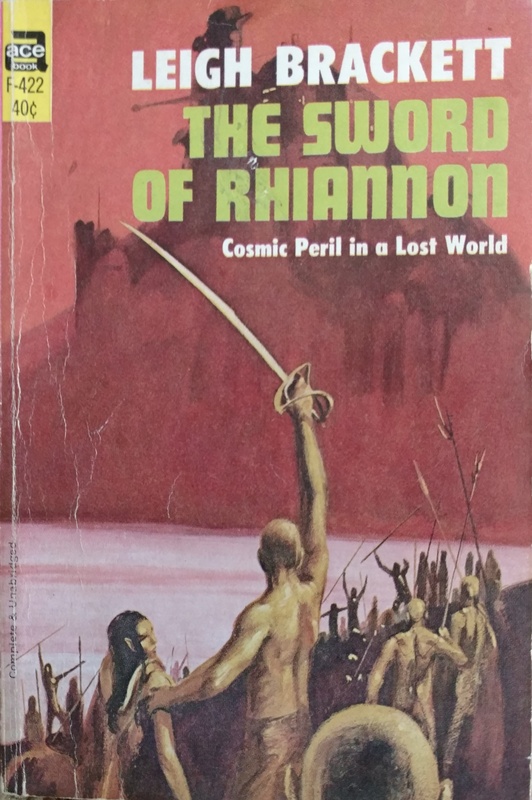 It is, in fact, the titular sword of Rhiannon. We’re given just a little background on Martian history, enough that we know that this is a big deal. This Martian, whose race I don’t remember off the top of my head, tells Carse that he has discovered the long lost tomb of Rhiannon and is willing to split the loot with him if Carse comes along to explore. We get a picture of Carse as a guy who only looks out for himself and is willing to screw over other people to get what he thinks he deserves. He’s not exactly likable at this point. His outlook never changes as the book goes on, yet he still comes out on the heroic side. Most of what gets him to act heroically is a thirst for revenge that is justified on the sole grounds that his enemies are irredeemably evil, like that’s valid. I think the one thing that makes Carse the hero is that he gets screwed over more often than he does the screwing. The Martian guy and Carse go to the tomb, where the Martian screws Carse over and pushes him into a pit or something. Carse falls for what feels like ages and then wakes up back in the tomb. He escapes to find Mars is no longer a barely-habitable wasteland, but rather a lush paradise. Since his main power is to know history, he figures out that he has somehow fallen over a million years into the past. Past Mars is even crazier than regular Mars. I don’t remember if all the races represented on past Mars are still extant on regular Mars, but there are a lot of them and they are, for the most part, not friendly to one another. There are “humans,” but there are also several “halfling” races who are definitely not hobbits. There’s a wingéd race, a fishéd race, and a snakéd race. The snakes are the bad guys, just in case you couldn’t figure that out on your own. Man, adventure stories sure do hate snakes. Carse still has the Sword of Title Drop, and people recognize it. The problem is that Rhiannon is not a well-liked figure in Martian history. He was one of a race called the Quiru, a powerful, ancient, and technologically-advanced race that once lived on Mars before they left. Rhiannon didn’t leave. He was the Betrayer. The other Quiru didn’t like it when he gave some of their technology to one of the native Martian races, namely the snake people. The snake people are also known as the Dhuvians. They are allied with the Sark, a group of humans, although we learn that this is not a friendly alliance at all. This works to Carse’s benefit. Before that, though, Carse gets enslaved and put on a Sark boat. It’s there that he meets Ywain, princess of the Sark. At first I expected her to be the Dejah Thoris of this story, but I was wrong. She and Carse are hostile to one another through the majority of the story. She is, of course, extremely beautiful. It would be good to tame this woman. It would be good to break her utterly, to tear her pride out by the roots and stamp on it. There are a few other moments like this, and it hurts me inside to think that Leigh Brackett wrote them. Perhaps they were added later by the publisher or something. Of course, the upshot here is that in the fifties science fiction was still very much a boys only club, even when it was being written by a woman. Carse leads a mutiny, takes Ywain prisoner, and leads the ship to adventure. He hangs around with the wingéd people for a while, who don’t trust him. We learn a lot of history, especially as it applies to Rhiannon, and it is speculated that Rhiannon is not actually dead but is actually possessing Carse and might someday take control. I find this fascinating because the back of the book said the exact opposite. There’s this scene where the wingéd people prove this to be true. It turns out that all the halfling races on Mars are a little bit psychic and so they read Carse’s mind. Rhiannon starts trying to talk to Carse, usually saying things like “Let me explain myself,” but Carse won’t listen. He’s mad. This goes on for a while until, exhausted, Carse finally listens to what Rhiannon has to say. Yes, he betrayed his people and gave the Dhuvians forbidden technology. What’s important, though, is that he totally regrets that now and sees the Dhuvians for how evil they are. He wants to make amends and fix it, if only Carse will let him. Carse doesn’t believe him, which is understandable. About this time I was starting to think that the only reason Rhiannon was sorry was because he got caught, you know? Somebody, probably Carse’s friend Falstaff Boghaz, suggests that Carse use this to his advantage and lead a group of people against the Dhuvians. It’s a workable plan. Rhiannon was the god-king who gave the Dhuvians all the power they needed to lead a takeover attempt of Mars, so obviously they would listen to him. It just means he has to be really convincing. Of course, being snake people, the Dhuvians see right through it from the start but lead Carse on for a while. Probably they get off on it. Friggin’ snake people. Along the way, the snake people say something that proves Rhiannon was telling the truth the entire time. I guess these kinds of stories just aren’t as subtle as I’d like them to be. In a fit of rage, Carse gives full control of his body to Rhiannon, who uses some kind of ultraviolet ray weapon to kill all the Dhuvians, thus saving Mars and the day. The sol? Oh, I should mention that at some point Ywain and Carse came to a bit of an understanding. Yeah, her people are allied with the Dhuvians, but it’s not something she’s ever been particularly keen on. It’s all her dad’s fault. He’s a weak king and a bit of a crybaby. She’d never let her people fall under the yoke of the snake people, assuming snake people have yokes. Writer’s prompt: a world where all the big farm animals are giant docile snakes. So with the Dhuvians destroyed, Rhiannon redeemed, and Ywain (ugh jesus) tamed, Carse is set to live out his life in merriment and happiness forever. Or he would be. I mean, he straight up says, repeatedly, how great this past Mars is. But he says something like “a man’s place is in his own time” and so Rhiannon helps him get back to the present. BUT, despite the fact that “a man’s place is in his own time,” a woman’s place is wherever a man is, so Ywain agrees to go with him. Despite the really problematic gender politics, this book was great. Rip-roarin’, page-turnin’ great. Yeah, it relied heavily on a lot of established world-traveling adventure tropes established mainly by our pal ERB, but it also played with them in a few surprising ways. Instead of an earthman going to Mars, for instance, this was a book about a Marsman going to Mars. Just a different Mars. I gotta give it up for that alone. The best developed character was probably Carse’s pal Boghaz, who was essentially just a fat, greedy, lying, cowardly guy. He was fairly likable. At least I always knew what his intentions were while simultaneously not knowing exactly what he was going to do. He was that standard deceitful sidekick who would sell out the hero in a second if it didn’t turn out that the hero wasn’t an ancient god. Not exactly a character to emulate, of course, but enjoyable to read. Carse is your standard adventure hero: competent and willful. Even Ywain has a bit more character than I’m used to. Sure, she’s beautiful, but she’s got motivations. If there were some sort of variant on the Bechdel test that asks whether a woman character’s motivations ever revolved around something other than a man (that would be a useful tool! ), she’d pass. Not a lot of women in sci-fi would, especially in the fifties. I’m glad I read this book, and not just because it took me less than two hours. That helped, though. It was a very short book, but moreover it was streamlined. I appreciate that a lot these days. My non-review stack of books currently contains Alan Moore’s newest, Jerusalem, which sits at a hefty 1600 pages. I love Alan Moore, but I think maybe there’s some fat in that book that could have been trimmed. I say that before reading it, so I might be wrong. We’ll see. In the end, I think the most I can say about this book—besides the fact that I enjoyed it immensely—is that it wasn’t especially different from similar works of the time period that were written by men. This is a shame seeing as how the female perspective is so constantly lost in the genre. This is a thing I’ve felt about the other Brackett novels I’ve read, and I’m wondering if any of them stand out as especially—for lack of a better term—womanly. I want the perspective of that other X chromosome. It’s more than just strong female characters, and it’s sure as hell not about being “nurturing” or “motherly.” It’s about perspective. I know that Brackett is a good enough author that she could bring that perspective to bear and make it shout. I’d like to see that. I made it this whole review without making a Fleetwood Mac joke. What is wrong with me today? I should have added that otherwise your review was a pretty good one. Ew, no. No taming required or wanted over here. If you want someone docile/submissive/whatever, find someone who is already like that, OR who wants to be like that. If a man sees a woman he wants, and is all “I will bend her to my will” without knowing anything about her, that is just gross.